Each split-level townhouse faces the Gulf of Mexico. 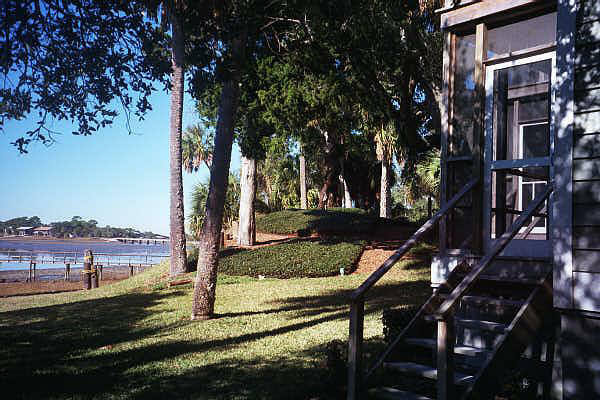 The rooms are large and airy and are decorated with local Cedar Key Island charm. The living rooms have sliding glass doors that open onto one of two private screened porches so you can bring the outdoors inside. Six people can sleep comfortably in each townhouse. There are 2 separate bedrooms, each with its own full bathroom. The bedrooms are well separated for complete privacy from other guests. A full kitchen is ready for cooking up the day's catch or preparing tomorrow's picnic lunch. The kitchens are fully stocked with dishes, cookware and pots and pans for your convenience. Amenities include a microwave, dishwasher, toaster and coffee maker. Each townhouse has a washer and dryer for your convenience. A fully enclosed garage keeps your car out of the afternoon sun and provides a place to store your kayak and fishing gear.